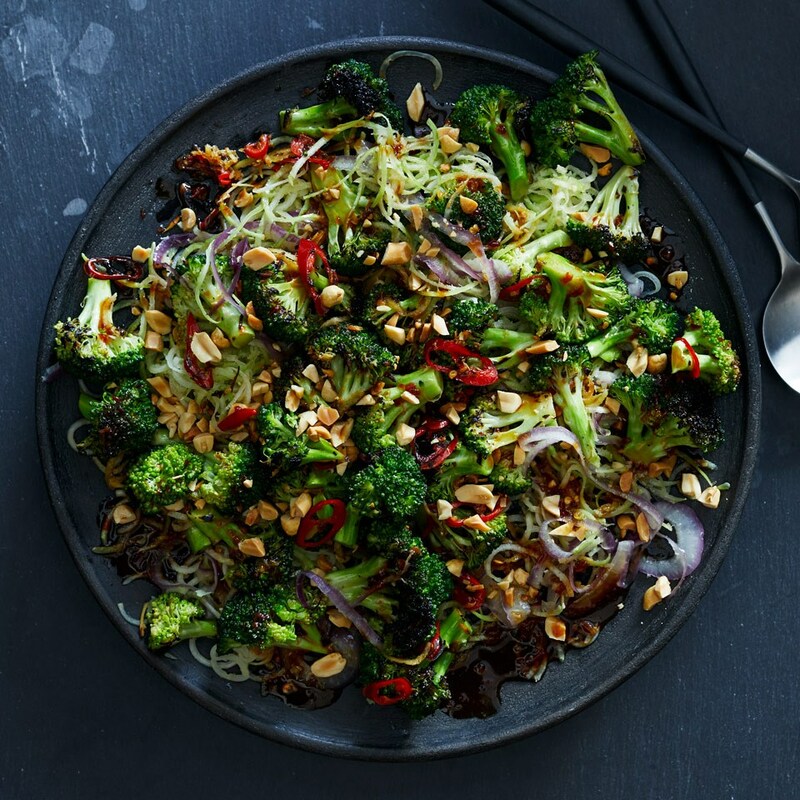 Spiralized broccoli stems transform into tender noodles in this lo mein-inspired vegetarian recipe. Serve on top of brown rice or buckwheat soba noodles. Remove florets from broccoli stems. Cut the florets into 1-inch pieces and set aside. Trim the stem ends. Using a vegetable spiralizer with the thin-noodle blade, spiralize as much of each stem as possible. Chop any remaining stem into ½-inch pieces. Switch to the thick-noodle blade and spiralize onion. Whisk ¼ cup water, rice wine (or sherry), tamari, chile-garlic sauce, 2 teaspoons sesame oil, cornstarch and brown sugar in a small bowl. Set by the stove. Heat 1 tablespoon peanut oil in a large flat-bottom carbon-steel wok over medium-high heat. Add the broccoli noodles, stem pieces and onion; cook, stirring, until tender, about 5 minutes. Transfer the mixture to a large bowl and toss with the remaining 2 teaspoons sesame oil and salt. Add the remaining 1 tablespoon peanut oil, chiles and ginger to the pan. Cook, stirring constantly, for 15 seconds. Add the reserved florets and cook, stirring, until starting to brown, about 1 minute. Add the remaining ¼ cup water, cover and cook until the florets are tender, about 3 minutes more. Uncover and add the reserved sauce. Cook, stirring, until the sauce is thick, about 1 minute. Arrange the noodle mixture on a platter with the florets on top. Serve sprinkled with peanuts. Subscribe to get exclusive content on contests, deals, events and more!